USADA announced today that an independent arbitrator has rendered a decision in the case of Jon Jones, of Rochester, N.Y., and determined that Jones should receive a 15-month sanction for his second violation of the UFC Anti-Doping Policy. This decision comes after the facts of the case were presented and fully argued at an evidentiary hearing on September 15, 2018. Jones, 31, tested positive for a prohibited substance as result of a sample collected during the in-competition testing period on July 28, 2017, before his bout at UFC 214 in Anaheim, Calif., an event sanctioned by the California Athletic Commission. Jones’ sample contained 4-chloro-18-nor-17β-hydroxymethyl,17α-methyl-5α-androst-13-en-3α-ol (M3), a metabolite of dehydrochlormethyltestosterone (DHCMT), or another chlorine-substituted anabolic steroid. Chlorine-substituted anabolic steroids, including DHCMT, are non-Specified Substances in the class of Anabolic Agents and prohibited at all times under the UFC Anti-Doping Policy, which has adopted the World Anti-Doping Agency (WADA) Prohibited List. Prior to the hearing, USADA determined that a 30-month reduction in the otherwise applicable period of ineligibility was appropriate under the rules based on Jones’ delivery of substantial assistance. Evidence related to Jones’ substantial assistance was presented at the hearing and considered by the arbitrator. The sanction was further reduced by the arbitrator based on Jones’ reduced degree of fault and the circumstances of the case, including the fact that Jones had been tested on multiple occasions leading up to UFC 214, and as recently as three weeks prior to the event, all of which yielded negative results for prohibited substances. Jones’ 15-month period of ineligibility began on July 28, 2017, the date his positive sample was collected, making him eligible on October 28, 2018. In addition, Jones’s victory at UFC 214 was recorded as a no-contest, and the UFC stripped Jones of the championship belt. The athlete’s positive test also falls under the jurisdiction of the California State Athletic Commission, which previously fined Jones $205,000 and revoked Jones’ license until the conclusion of the disciplinary process administered by USADA under the UFC Anti-Doping Policy. 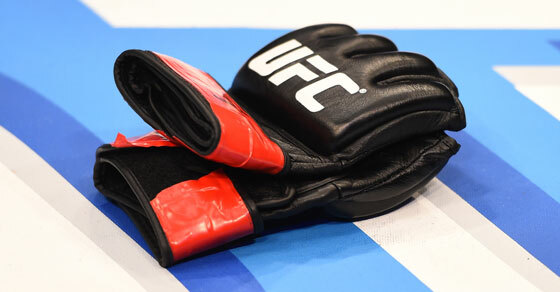 The case was heard and the decision rendered by Richard H. McLaren, chief arbitrator from McLaren Global Sport Solutions, Inc. (MGSS), and can be found here, along with all other UFC Anti-Doping Policy arbitral decisions. Jones’ first sanction led to a one-year period of ineligibility and was imposed by an independent arbitration panel in 2016. Pursuant to the UFC Anti-Doping Policy, all UFC athletes serving a period of ineligibility for an anti-doping policy violation are required to continue to make themselves available for testing in order to receive credit for time completed under their sanction. USADA conducts the year-round, independent anti-doping program for all UFC athletes. USADA is an independent, non-profit, non-governmental agency whose sole mission is to preserve the integrity of competition, inspire true sport, and protect the rights of clean athletes. 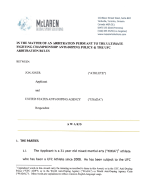 In an effort to aid UFC athletes, as well as their support team members, in understanding the rules applicable to them, USADA provides comprehensive instruction on the UFC Anti-Doping Program website (https://UFC.USADA.org) regarding the testing process and prohibited substances, how to obtain permission to use a necessary medication, and the risks and dangers of taking supplements (www.Supplement411.org) as well as performance-enhancing and recreational drugs. In addition, the agency manages a drug reference hotline, Drug Reference Online (https://UFC.GlobalDRO.com), conducts educational sessions, and distributes a multitude of educational materials, such as an easy-reference wallet card with examples of prohibited and permitted substances, an athlete handbook, and periodic alerts and advisories.